On 11th November 2017, Only Watch will host the seventh edition of the charity auction in Geneva. Zenith is proud to be associate and able to support this campaign by donating a unique edition of the breathtaking innovation of 2017, the Defy El Primero 21 Only Watch Edition, with a new 1/100th of a second Chronograph movement and a double chain structure with two regulators. 44 mm black DLC titanium case with touches of yellow especially dedicated to Only Watch, this unique Defy El Primero 21 will be auctioned in a customized Only watch box. For the lucky owner of the watch, there will be a unique experience with Zenith: a trip to the discovery of one of the most important swiss Manufacture of the world, the Zenith Swiss Watch Manufacture. Zenith will take care of this amazing trip. 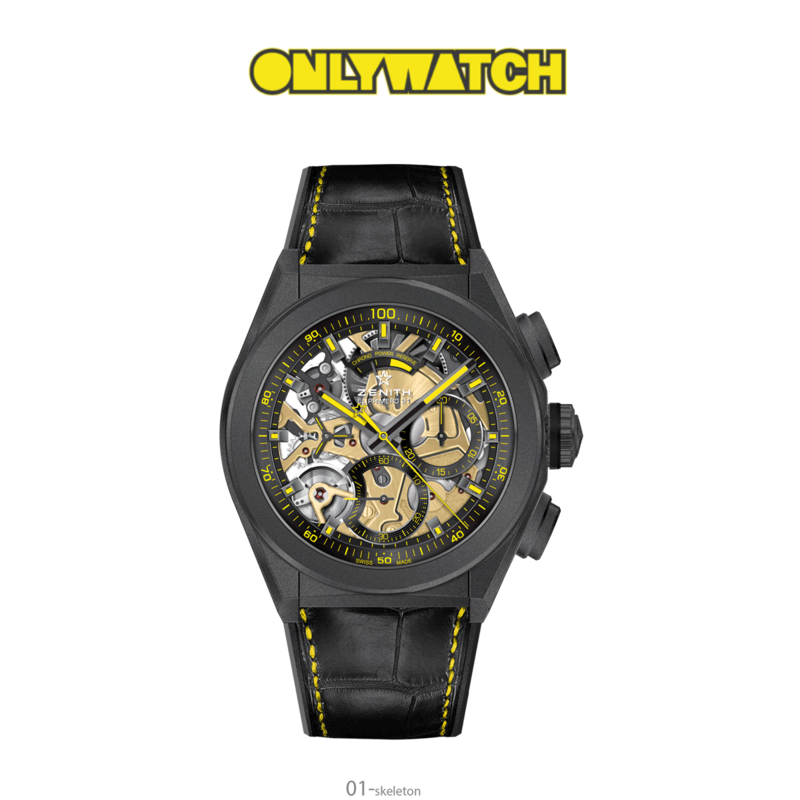 Created more than ten years ago, Only Watch is one of the largest charity events in the watchmaking industry’s calendar, organized by the Monegasque Association against Muscular Dystrophy (AMM) and the Monaco Yacht Show. It’s a biennial auction of one-of-a-kind timepieces from which the proceeds are donated to funding top-flight scientific research on the extremely serious Duchenne form of muscular dystrophy, discovered by French neurologist Guilllaume Duchenne in 1858. This time, The Swiss watch Manufacture Zenith is presenting a new special edition of the revolutionary Defy El Primero 21. Launched at Baselword 2017, the Defy El Primero 21 stems from modern engineering, all designed to ensure simplified assembly and adjustment serving to achieve the finest level of performance and certification. The world’s most accurate series-made chronograph in 1969 entered in a whole new era with a frequency that reaches an impressive 360,000 vibrations/hour ensuring its hundredth of a second precision, and energy consumption is ten times higher than in the original. From tenths to hundredths of a second, a quantum leap in terms of performance and engineering. To avoid any risk of the chronograph interfering with the smooth running of the watch, the Defy El Primero 21 is therefore equipped with two independents “gear boxes”: one for the time (36,000 VpH – 5 Hz) and the other for the chronograph (360,000 VpH – 50Hz). Each has its own transmission and escapement system and there is no coupling clutch. Alongside its integrated construction, its double-chain architecture and the remarkable chronometric performance, the El Primero 21 movement features a patented chronograph-reset control mechanism composed of three heart pieces and an exclusive starter mechanism, ensuring simultaneous resetting of the seconds as well as tenths and hundredths of a second. Representing the aesthetic, visual and audible signature of the new Defy El Primero 21, its central chronograph hand performs a full turn of the dial in one second. This simple, immediate and direct reading of the hundredths provides an opportunity to grasp the reality of the second being measured. 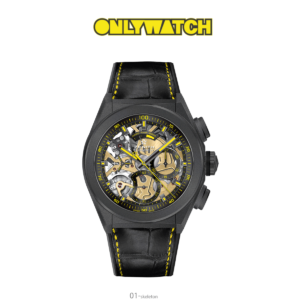 This watch is a unique combination of materials and colors housed in a powerful 44 mm black DLC titanium case and black rubber strap with black alligator leather coating with yellow stitching. The caseback will be specially engraved and the sapphire crystal will bear the logos of Only Watch and the Monegasque Association against Muscular Dystrophy.The Defy El Primero 21 Only Watch edition embodies the new generation of Zenith chronographs, based on contemporary mechanics endowed with an unprecedented visual and dynamic identity. It has the signature of an authentic Swiss manufacture, and the promise of new innovations to come.